Lit from Within: That's Plum-Crazy! 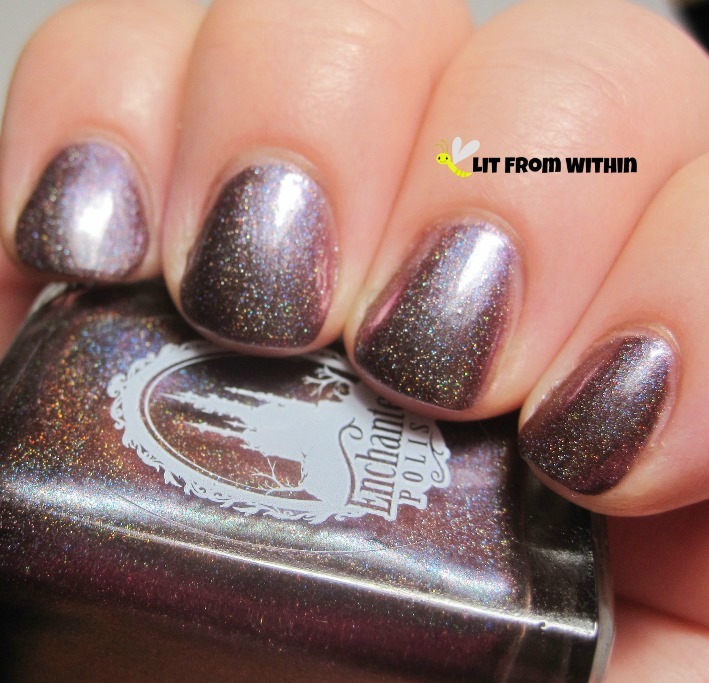 I made it to day 2, with an awesome plum holo compilation and comparison to show you! I love plum. Hmm. 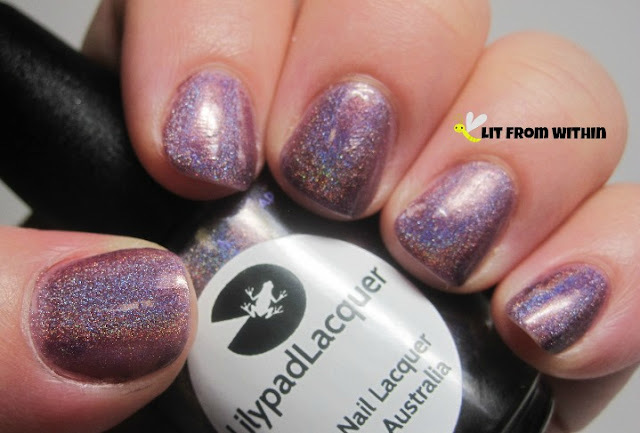 Another Lilypad Lacquer? Yep! This is Velveteen. I do so hope it's named for the Velveteen Rabbit, which is one of my fave stories. Also, why I may still have one or two of my fave, well-loved stuffed animals from my childhood. This polish is also going to be well-loved in my collection. Great application, lovely holo, perfect plum. 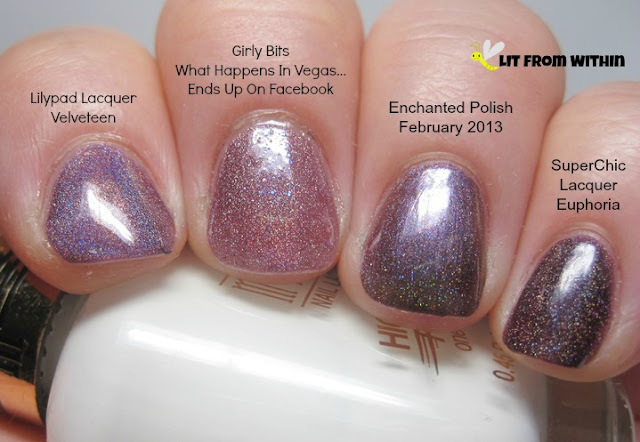 Girly Bits What Happens in Vegas...Ends Up On Facebook was an LE made for a convention, and then released to the general populace for a few mins before it sold out. This is a lighter plum base with lots of holo. 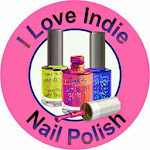 Girly Bits was one of the first Indie Polish makers, and she's still got it. Of all the Enchanted Polish Calendar polishes, I think February 2013 had the widest distribution. I was very happy to get one because I love purple, and February is my birth month. Go, Aquarians! This one has a green duochrome effect that I couldn't capture well, but you can kinda see it a little in this pix, along the tips. Lastly, I want to show you this beauty, Euphoria, from Superchic Lacquer (WonderBeauty Products). It comes the closest to the dark plum base of February 2013, but doesn't have the green shift. 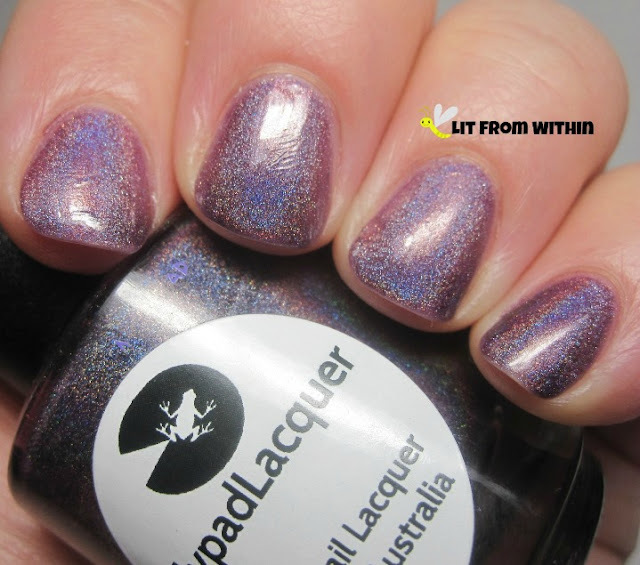 I love this type of deep, rich plum holo. 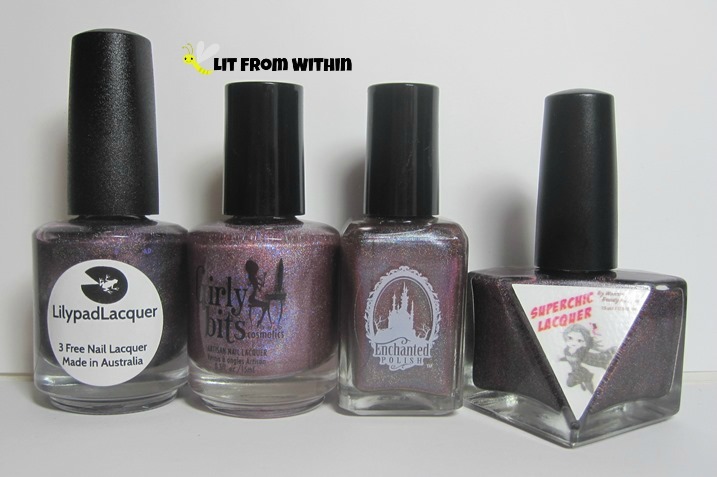 Here's the bottle shot: Lilypad Lacquer Velveteen, Girly Bits What Happens In Vegas...Ends Up On Facebook, Enchanted Polish February 2013, and SuperChic Lacquer Euphoria. No dupes here! Velveteen seems to be lighter on the nail than in the bottle, and the Girly Bits does, too. February almost seems darker on the nail than in the bottle. Are you plum-crazy for plum holos? Which is your fave, even if I don't have it here? thanks, Lisa! I love a good plum. Purples of all kinds are my weakness... and blues... and maybe greens..
Then you must also be super-awesome! lol! It isn't going to be restocked at her store, but money always talks! 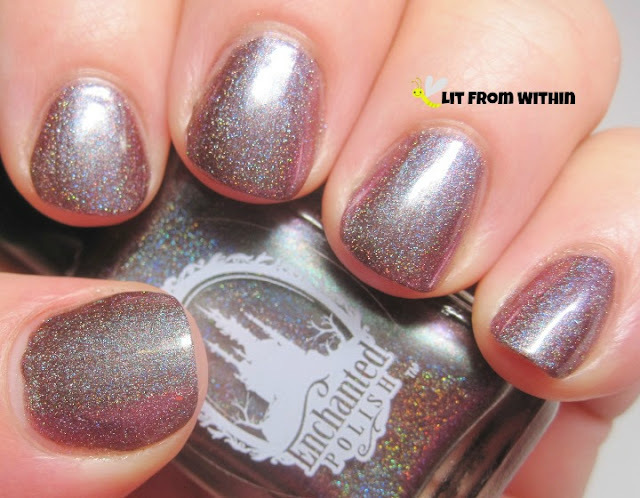 Enchanted is probably one of the MOST popular Indies, and her polishes start reselling around $25, and go up from there. I would avoid Ebay, but check out the polish sale groups on Facebook.